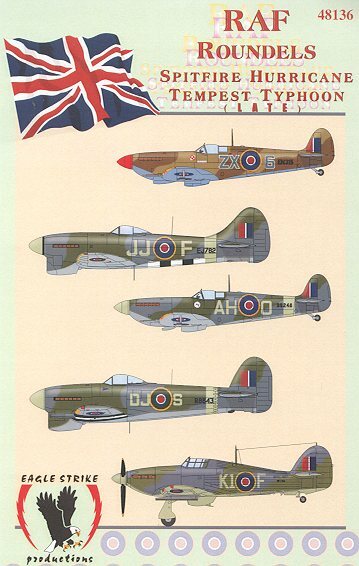 This sheet is for later war RAF fighters, which include Spitfires, Hurricanes, Tempests and Typhoons. I'm sure you could have these fit Whirlwinds and Defiants as well with no problems. 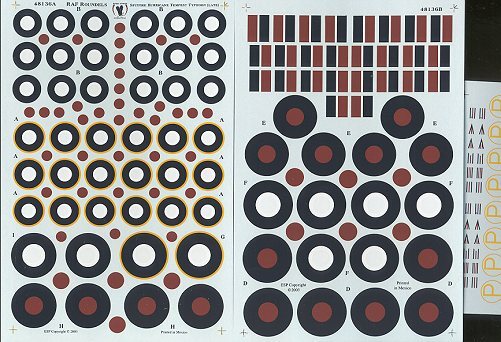 As with the previous sheet, there are a goodly number of roundels in various sizes. The sheet also includes fin flashes in different sizes. A smaller sheet includes prototype markings as well as command pennants in various shapes. Like the previous sheet, this one has full instructions on what size goes on what aircraft on the back of the cover sheet. The perfect addition to your decal collection. I don't know about you, but I've always found sheets like this to be extremely useful. This is especially true when one has three schemes on a sheet and not enough insignia to allow one to do all the aircraft on the sheet. They are also quite helpful when the kit decals are less than outstanding!